back when he was super cool. For most Colombians, serving in Congress would be a dream job: Get paid millions to sit around talking, a free security detail and other benefits – and often you don’t even need to show up for work. And there’s also the widely-believed potential for corrupt side benefits from selling political influence. According to Colombian police and the U.S.’s DEA, while getting ready to serve in Congress, Santrich was also scheming to traffic tons of cocaine to the United States. The FARC guerrillas were notorious for participating in the cocaine trade, but under the peace treaty the guerrillas signed with the Colombian government, narcotrafficking was considered a political crime eligible for amnesty. 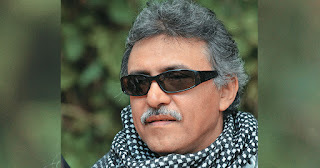 But, according to the allegations, Santrich continued trafficking after the deal was signed, which would be a crime. Ironically, the alleged narcotrafficking attempt would be a trivial crime compared with the many outrages the FARC guerrillas committed while Santrich was in charge of part of their radio propaganda. Those included massacres, recruitment of child soldiers, forced displacement of peasants, violence against women, kidnapping and on and on and on. The FARC have charged that Santrich is being framed. But U.S. and Colombian authorities say that their evidence, including recorded phone conversations, is strong. And it seems very unlikely that the Santos government, which has made peace with the FARC the center of its administration, would want to endanger that agreement. If, as seems likely, Santrich is extradited to the U.S. for trial and imprisonment, his story will stand out for one thing: immense stupidity. The case is reminiscent of the story of cartel leader Pablo Escobar’s son Juan Pablo, who moved to Buenos Aires and became a successful architect, but allegedly continued using his old narco connections to help Colombian traffickers make deals with Argentine businessmen. Go figger.